This petition has been created by Environmental Justice Foundation . and may not represent the views of the Avaaz community. **UPDATE** EJF Executive Director Steve Trent met with Tesco senior executives right before their Annual General Meeting in London on June 27th. He delivered this petition and called for assurances that Tesco will be taking action to eradicate slavery from its supply chains. The meeting was very positive and we are now waiting for an official response. We look forward to more positive updates soon! Thanks for your vital support. Let's keep up the pressure -- sign and share this with everyone! 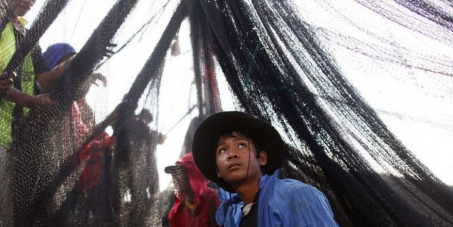 Recent investigations by the Environmental Justice Foundation and The Guardian have shown serious human rights abuses including trafficking, slavery and murder in the Thai seafood industry. One migrant fisher saw a fellow crew member being murdered, reporting: “The other captains came and pinned him down. They tied his hands and legs to four boats, and they pulled him apart." Thailand is a major supplier of prawns to the UK, and Tesco is one of the biggest companies that buys from a massive Thai company linked to this slavery. Tesco’s Annual General Meeting is tomorrow, and if enough of us call on them now, they can lead the way to stop the seafood slavery. They say they use their scale for good and that meeting customer needs is a priority. So let’s ask them to stop buying Thai prawns until they’ve finished rigorous, independent audits of their full supply chain. We have to move fast, while this news story is fresh. Click below to sign now, then share this with everyone, so we can make it massive before we deliver it to Tesco’s CEO Philip Clarke in front of their shareholders and the watching media at their big meeting.